With a drying area of 21 x 31 cm, the Midi gel dryer can dry six 10 x 10cm gels or a single larger gel. The Maxi Gel Dryer with a 35 x 45cm drying area can dry twelve 10 x 10cm mini gels simultaneously. The unit’s microprocessor controls temperature and time, each parameter being displayed on its own LED display. 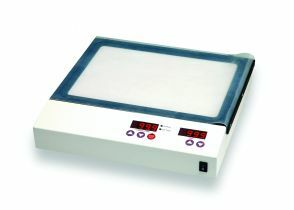 The gels are heated from the base plate while the vacuum removes the moisture from below to dry the gel homogeneously. 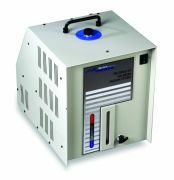 These dryers feature optimal sealing using a silicone rubber cover and supporting mask. When applying the vacuum, a groove that frames the drying surface provides an optimal tight seal during the drying. GelMaster™ Vacuum Pump features two pumps in one package: a room temperature vapour trap acts as a pump by condensing the hot vapours from the gel dryer and trapping them from the rest of the systems; this is followed by a high efficiency diaphragm pump, delivering a powerful, non-fluctuating vacuum for fast, smooth drying, which acts as the primary vacuum source. The pump is so efficient, one GelMaster™ can be connected to three gel dryers simultaneously. It’s 1.5L capacity allows between 10-15 gels to be dried before the trap needs to be drained. The GelMaster™ trapping medium can be used repeatedly.